It’s that time of year again, and with the Christmas shopping well under way (at least for the prepared) many of us will be buying digital devices for children, with technology continuing to feature high on those wish lists for Santa. This year’s top gaming consoles include the Xbox One X, which was released on November 7th with its timing (just ahead of Christmas) being no coincidence. It retails for just under £450, but if Microsoft’s price tag turns you off, then there’s always last year’s Sony PlayStation 4 Pro, which is available for just £300. Children’s fascination with tablets doesn’t seem to be waning either. Whilst sales of adult tablets have continually declined over the last three years, specially designed tablets for children under ten have remained popular. This year sees the Kurio Tab Advance and the LeapPad 3 on the recommended lists. These give parents the reassurance of a 'safe' web browser or no Internet access and games and pre-loaded apps which are appropriate for children. It’s when children reach the age of ten or eleven that the desire for more sophisticated technology sets in. Young people may well become frustrated when they can't get the same games or apps as their friends have on Android or iPad. Devices such as the Amazon Fire 7 offer a happy medium, allowing parents to set up password-protected profiles so they can give each child access to only the books, games and apps they want them to see. But what happens when children reach an age where they want to interact with their friends online? Games consoles have always been highly targeted at the teenage market. Once designed solely for playing games, consoles are now connected to the Internet to allow a more interactive and collaborative experience. Consoles today don’t just allow gamers to play games with others, but also allow them to exchange photos, engage in live messaging and even ‘host’ parties online. Despite being very different devices, games consoles and tablets carry similar risks for young people. A recent study of 11-16 year olds held by Kaspersky made for interesting reading. Whilst 23 percent had been asked personal or suspicious personal questions online, as many as 20 percent said that they trusted the gaming platform so much that they would see no problem meeting contacts from it in real life. Nearly a third of the children in the study said that their parents had no idea who they talked to when they played games. In the UK, a similar study held by the Oxford Internet Institute (OII) at Oxford University — which analysed Ofcom data from 515 homes with 12-15 year olds — found that eight percent of those who had been interviewed had been contacted by strangers. Four percent said they had encountered another person pretending to be them online and two percent had seen something of a sexual nature that had made them uncomfortable. Their parents were also interviewed about whether they had used technical tools to control or manage their child's access to online content. Only one-third of the parents said they used content filters, with two-thirds (66%) saying they had not. One quarter (24%) of the parents did not know or were unaware of the filter technology at the time of the interview. But whilst filtering might seem like a quick fix, one that can be ‘switched on’ and then forgotten about, questions still remain about whether this is truly an effective way of protecting young people. Even the best filters are never completely watertight, and on the flip side, some filters can be so strictly configured that they can over-block, preventing teenagers from accessing helpful content on topics such as sexual relationships or drug and alcohol abuse. Rather than prioritising Internet filtering, the OII study (amongst others) suggests we should place greater focus on educating and supporting teenagers about using the Internet responsibly, with emphasis on how teenagers manage online experiences that make them feel uncomfortable or scared. Parents should start the conversation about online safety at a young age, so more serious conversations about risk can be discussed as the child gets older. Once young people know that their parents understand what can happen online, it gives them greater confidence to approach parents for an open dialogue about any concerns and bring to light any negative experiences they might have had. Does your school hold regular workshops with parents about online safety? The run up to Christmas can be a great time to have these conversations before the winter holidays. 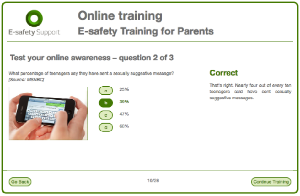 Engaging parents provides a more holistic approach to online safety, building a better school community and one that takes a proactive approach in helping families stay safe, as recommended by Ofsted. If you’re looking for resources to help you engage parents, E-safety Support offers a number of resources; including parent packs, e-safety factsheets and guidance documents specifically for parents. There is also an online training course designed as a simple introduction to e-safety which will provide some much needed information to help parents start to understand possible e-safety problems and give them a foundation for making decisions about technology usage within the home.